Lieutenant of the Russian Navy. Born in Nikolaev, in the family of naval sailor Lev Alekseevich Brusilov, later chief of the naval general staff. He grew up on the sea and loved him since childhood, he was attracted to the marine way of life, ship life and customs. The father in every possible way encouraged his son’s predilection for the sea, taught him to swim perfectly and operate the boat under sail. The education received from the father has formed and strengthened in the boy the qualities necessary for the sailor: courage, determination and resourcefulness at a difficult moment. After graduating in 1903 from the Naval Cadet Corps to a nineteen-year-old youth, he took part in the Russian-Japanese war, first on the destroyer and then on the cruiser Bogatyr. He served in the Far East, on the Baltic Sea. In the years 1910–1911, Brusilov took part in the hidrographic expedition SLO at the isebreaker ship "Vaigach", making a transition from St. Petersburg to the expedition's home base - Vladivostok. In August 1910, he was transferred by the watch supervisor to the second vessel of the expedition of the icebreaker ship "Taimyr". On it, he participated in the first reconnaissance campaign and hydrographic work in the Chukchi Sea. In Brusilov, interest in the North aroused, an understanding of the importance of the Northern Sea Route for the development of the Russian economy. Being a very expansive, decisive, largely unbridled man, prone to harsh, unexpected actions, he was disappointed by the development of expedition. It seemed to him that swimming was proceeding unnecessarily slowly. 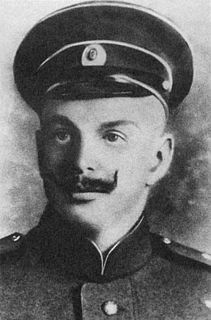 Brusilov decided to organize his own expedition, and in 1911, having obtained leave due to "domestic circumstances", he left for England and with the money of his uncle's wife, Lieutenant General B.A. Brusilova Anna Nikolaevna Brusilova purchased the beautiful steam yacht Pandora-II. She had a displacement of 231 tons and was adapted for swimming in ice. In honor of Brusilov, the ship received a new name “St. Anna". The main objective of the expedition was the intention to repeat the journey of N.-E. Nordenskiöld on "Vega", i.e. go through the Northeast Passage, with associated fishing for the sea animal. Scientific studies were not planned. In addition to Brusilov, the expedition included navigator V.I. Albanov, who graduated from the Samaritan courses and acted as a doctor, E.A. Zhdanko and 21 team members. Just before leaving the expedition, Lieutenant N. Andreev, the hydrologist Sevastyanov and the doctor, refused; navigator Bauman fell ill. As a result, the expedition was left without a complete management team, and even among the team there were many random people who were not ready either morally or physically for the ordeal. Food was taken for a year and a half. Due to delays while sailing around Scandinavia, the expedition started too late: on July 28 (August 10) of 1912 from St. Petersburg and August 28 (September 10) after a short stop, left Alexandrovsk-on-Murman. Of course, this also played a role in what happened to her. The ice situation in 1912 in the Kara Sea was extremely difficult. At the beginning of October, at the Yamal Peninsula, the ship was caught in ice and drifted north for a year and a half. During the first wintering part of the crew got sick with some incomprehensible disease. In the summer, with the advent of fresh meat, the condition improved. Attempts were made to free themselves from ice captivity, but already in August it became clear that this would not be possible. The second wintering took place even harder and had a depressing effect on the expedition participants. Relations between the commander and the navigator deteriorated sharply, with the result that Alban was suspended from his duties. After that, Albanov conceived the idea to leave the ship, for which he received permission from the commander. The navigator wanted to go alone, but 13 volunteers joined him. They left "St. Anna ”April 10 (23), 1914. Albanov took the expedition materials and mail with him. The fate of the remaining members of the expedition and the vessel is unknown. Most likely, the ship was crushed by ice, and people died of starvation, either with the ship or after landing on the ice. However, there are other versions. According to one of them, a vessel brought into the North Atlantic fell victim to a German submarine attack. Another version is associated with the French book Rene Gusi “In the polar countries. Yvonne Charpentier diary, the Russian translation of which was published in 1928 in Leningrad by the Vokrug Sveta publishing house. It describes the polar expedition in its plot, strikingly similar to the Brusilov expedition, although the name of the vessel and the names of the participants are different. It is very interesting that the book covers events that took place after the departure of the navigator.The conclusion suggests itself: the diary of E.A. Zhdanko, who somehow fell into the hands of the author of the book. Tip can be found in the diary itself. Its author, Yvonne Charpentier, writes that, left alone after the death of all her companions, she put the diary in a waterproof bag and threw it on the ice. How to evaluate this book? How fiction, hoax or genuine document? An even more sensational version was expressed by the writer M.A. Chvanov on the basis of his contacts with distant relatives of E.A. Zhdanko. The latter claimed that she, who had become Brusilova-Zhdanko, came in 1938 or 1939 to Riga with her child. They lived somewhere in the south of France. Hence the conclusion: “St.Anna ”nevertheless went out into the clear water, Zhdanko survived, but she could not or did not want to report about herself, taking care of the relatives who remained in the USSR. Maybe she herself gave Rene Guzi her diary? Here is an arctic mystery, one of many. Perhaps the most realistic information about the fate of “St. Anna ”entered in 1988 from the famous marine painter N.A. Cherkashin. In one of his trips abroad, he ended up in the German seaside town of Stralsund, where in one of the courgettes he saw a wooden steering wheel, to the hub of which was attached a Russian icon.It was possible to disassemble the Church Slavonic script: "Holy Anna of Kashinskaya." On the copper plate attached to the steering wheel, the erased Latin letters “... andor ...” appeared. From a conversation with the barman it turned out that his father, a former fisherman, had obtained this relic for the bar. In 1946, his trawler in a thick fog in the North Sea almost crashed into an abandoned sailing schooner, which had neither a flag nor a name on board. Cherkashin at that time was not familiar with the problems of the Brusilov expedition, did not know that “St. Anna "was called before" Pandora-II (Pandora) "and did not connect the received information with her. Most likely, it was a real trail "St. Anna ”, but he was not used. 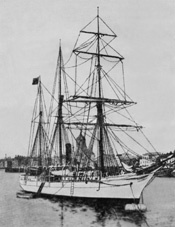 Despite the tragic end of the expedition, its materials, saved by Albanov, proved to be very valuable and made a significant contribution to the study of the Arctic. In particular, the presence of a northward current in the Kara Sea was established, its average velocity was calculated, the boundary of the continental shelf was determined, and the absence north of arch. ZFI Land of Peterman and Earth Oscar. Drift analysis Anna "allowed V.Yu. Wiese to make a conclusion about the existence of land between ZFI and Severnaya Zemlya. Ice Dome on the island of George Land archipelago Franz-Josef Land. Named cartographers in the 1950s.